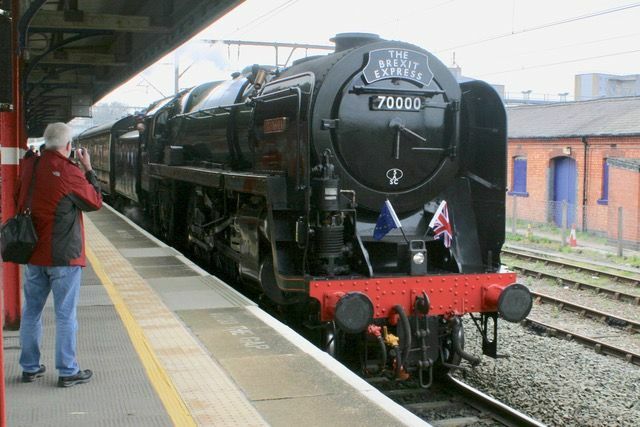 No 70000 'Britannia' visited Stockport on the 30th March with the 'Brexit Express' which ran from Swansea to Sunderland. The Manchester Locomotive Society was founded in the Manchester area in 1935. We hold regular illustrated talks in our meeting rooms in the Stockport area. These are held twice a month on a Friday evening from 7.30pm to around 9.30pm and given by a guest speaker or one of our own members. We try to cover all aspects of railway interest but in particular focus on past and present events and locations in the North West. The clubrooms are also open on most Wednesdays from 10 a.m. to 3 p.m. for general chat and use of the Library and Archive; occasional talks are also held on Wednesday afternoons. We publish a bi-monthly magazine, ‘The Mancunian’, which contains interesting and informative articles submitted mainly by members covering a variety of interests such the history of locomotives and lines, current events as well as personal reminiscences of the past. The success of this magazine is reflected by the number of ‘out of town members’ that we have and the lively correspondence it generates. The Society is the proud owner of an extensive and varied collection of books, photographs, and archive material covering locomotives, rolling stock, architecture and signalling. In addition the library has a comprehensive collection of timetables and publications from other societies. All of these are available to members. If you would like to join then please write (including a S.A.E.) to our Membership Secretary for more information.